Some of my favorite stories on DT have to do with Penn love. I've covered Penn alumni getting married on campus and have even covered some great Penn proposals. 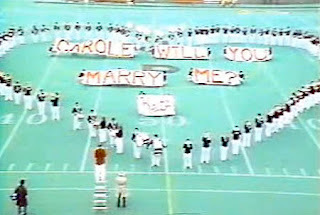 Well, I just discovered another Penn proposal from 1986 that was accomplished during the halftime show on Franklin Field with the help of the Penn Band. 0:55 - The band plays "Just a gigolo/I Ain't Got Nobody". A true sign of the times! 5:38 - the 1986 version of our creepy quaker dude!